The ICA believes that effective records and archives management is an essential precondition for good governance, the rule of law, administrative transparency, the preservation of mankind's collective memory, and access to information by citizens. 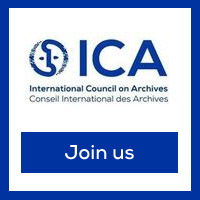 The International Council on Archives (ICA) is dedicated to the effective management of records and the preservation, care and use of the world's archival heritage through its representation of records and archive professionals across the globe. The ICA is a neutral, non-governmental organisation, funded by its membership, which operates through the activities of that diverse membership. For over sixty years ICA has united archival institutions and practitioners across the globe to advocate for good archival management and the physical protection of recorded heritage, to produce reputable standards and best practices, and to encourage dialogue, exchange, and transmission of this knowledge and expertise across national borders. With more than 1900 members in 199 countries and territories the Council's ethos is to harness the cultural diversity of its membership to deliver effective solutions and a flexible, imaginative profession. Membership of ICA is open to any individual or organisation concerned with the professional care of and access to archive collections. ICA Calendar at a glance! Eine Einführung in unsere Organisation Der Internationale Archivrat (ICA) setzt sich für die wirkungsvolle Verwaltung von Schriftgut und für die Erhaltung, Pflege und Zugänglichkeit des archivischen Kulturerbes der Welt ein durch seine weltweite Vertretung von Fachleuten der Schriftgutverwaltung und des Archivwesens. Представление нашей организации Деятельность Международного совета архивов способствует эффективному управлению документацией и обеспечению сохранности, хранению и использованию мирового архивного наследия через свое представительство в лице профессионалов в области архивов и делопроизводства по всему миру. ما هو المجلس الدولي للأرشيف مقدمة حول منظمتنا يسعى المجلس الدولي للأرشيف (ICA) إلى إضفاء الفعالية في تسيير الأرشيف و الاعتناء بالتراث الأرشيفي و حفظه و استعماله، وهذا من خلال تمثيل مهنيي الوثائق و الأرشيف في العالم قاطبة.